In their paper Model uncertainty in cross-country growth regressions (Journal of Applied Econometrics 2001), Fernández, Ley and Steel (FLS) demonstrate the use of Bayesian Model Averaging (BMA) for a cross-section economic growth data set. This tutorial shows how to reproduce the results with the R-package BMS. A video tutorial (09:56) summarizes the essential part of this web tutorial. Before continuing with the tutorial, you should have R installed (any version > 2.5) and the library BMS installed. 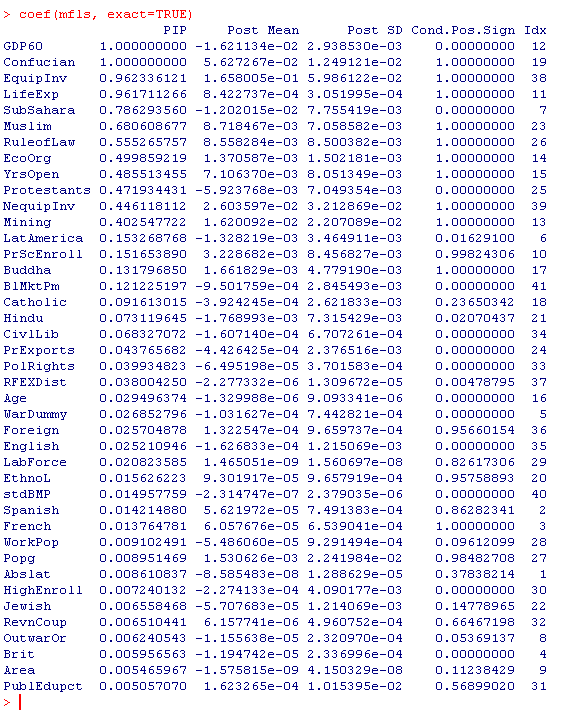 FLS use their own Fortran code to estimate the results in their paper. 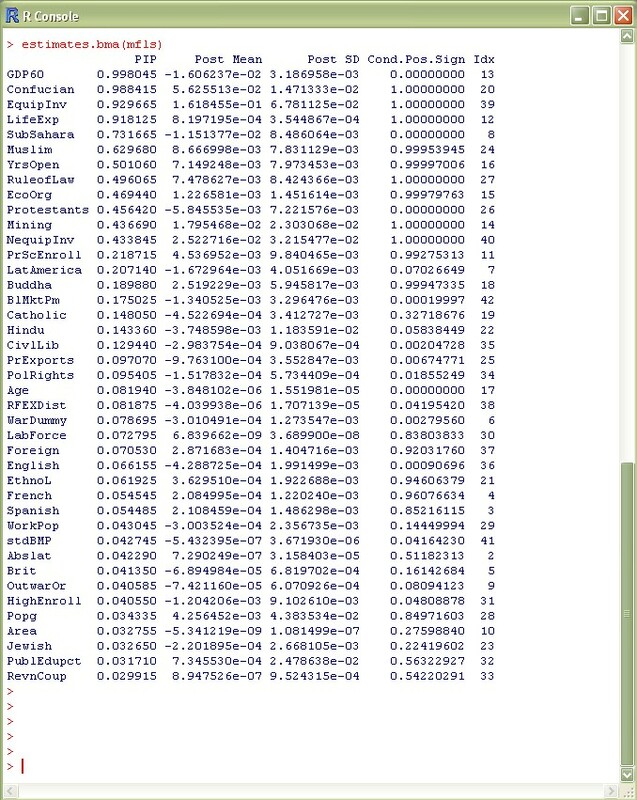 As described on p.6 they use their own dataset with N=72 observations and K=41 regressors. For Zellner’s g-prior they use g=max(N,K^2) (p.7): please note that in the FLS nomenclature, their g* is always smaller than one. Our g follows the more frequently used nomenclature and corresponds to g=1/g* where g* is the parameter used in FLS. 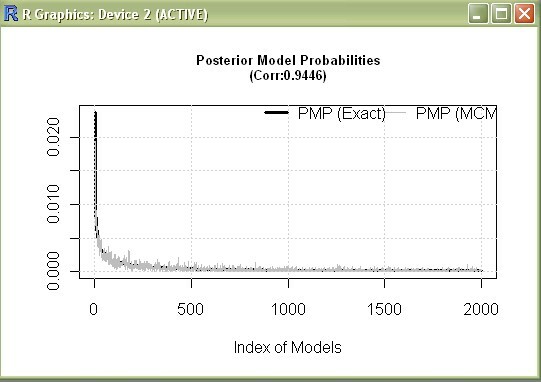 Their model prior is the uniform model prior (same prior probability for all models) – (p.7). For sampling through the model space, they use a ‘Birth/Death’ Metropolis MCMC (p.5) algorithm that wanders through model space by adding or dropping regressors from the current model. FLS use 1 million burn-ins and 2 million draws (p.7). Leave the prior specifications the same, but take 100 000 burn-ins, then 200 000 draws with the same sampler, and save the best 2 000 models. The variable datafls is now a data.frame containing the FLS data, with 72 observations and 42 rows (the dependent plus the regressors). Here, bms is the BMA sampling function (for more information type ?bms). datafls is the data to be sampled through, where the first column is the dependent variable. burn=100000 means 100 000 burn-in draws, with iter=200000 MCMC iterations after that. g="BRIC" sets the g-prior equal to max(N,K^2), something that was named ‘BRIC’ by subsequent authors as it bridges BIC and RIC. So in our case, this choice will set g=41^2. mprior="uniform" selects of course the uniform model prior (p(M)=K^-2), and mcmc="bd" selects the Birth/Death Metropolis sampler to iterate through the model space. The sampler will loop through the model space and save aggregate statistics. 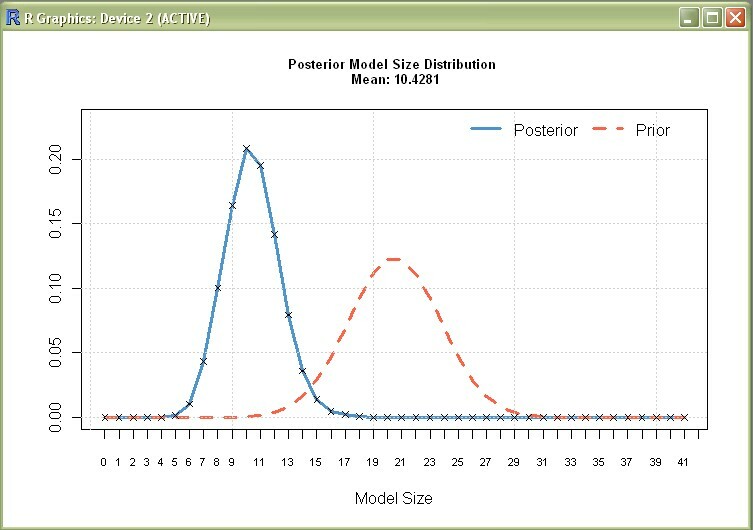 In addition, the argument nmodel=2000 forces it to store separately the best 2 000 models it encounters. By the way: user.int=FALSE just hides output from the user (you), as this tutorial should not confuse you more than necessary. 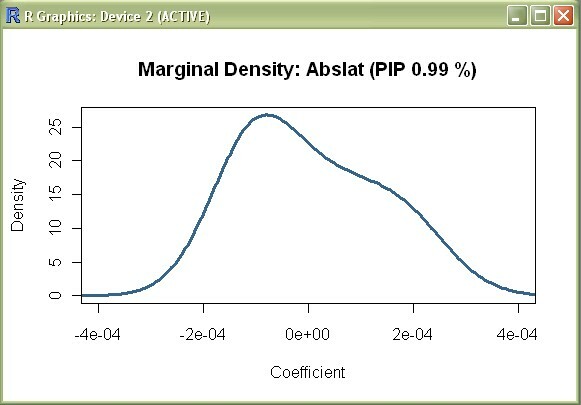 The parameter exact=TRUE states that the PIPs and coefficient statistics should be computed on the basis of the best 2 000 models saved in mfls. When comparing the results to the table on p.9 in FLS, one sees that the ranking and scale of PIPs pretty much matches up to FLS. 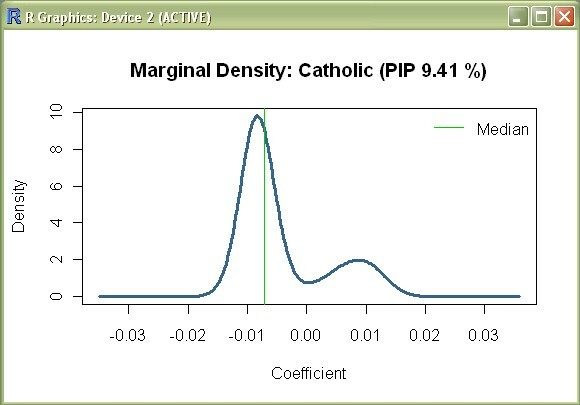 The column PIP details the posterior inclusion probabilities that corresponds to the table on p.9 of FLS. 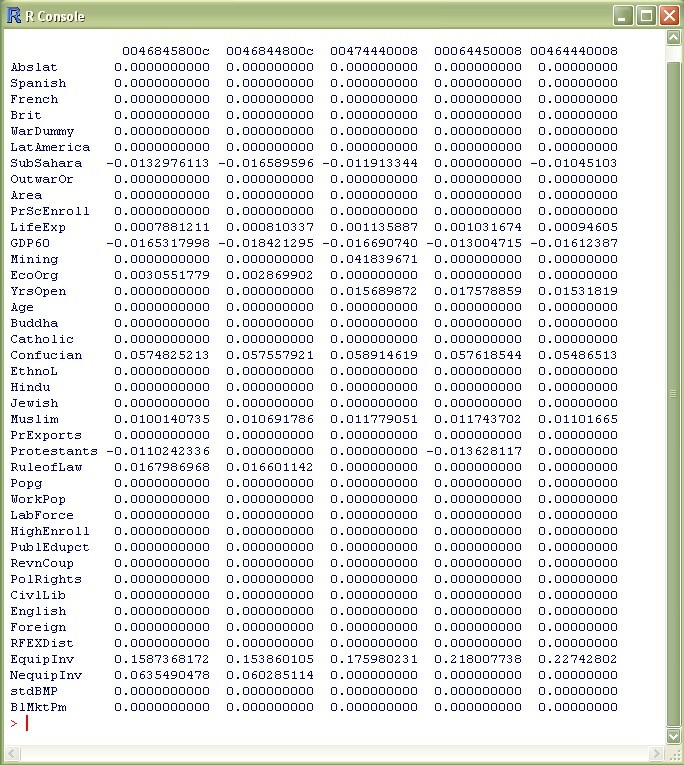 The column Post Mean shows the (unconditional) expected values (for information on the other columns, type ?coef.bma). This does exact=FALSE by default: This means that not marginal likelihoods are used for BMA, but the MCMC frequencies of the Metropolis sampler. 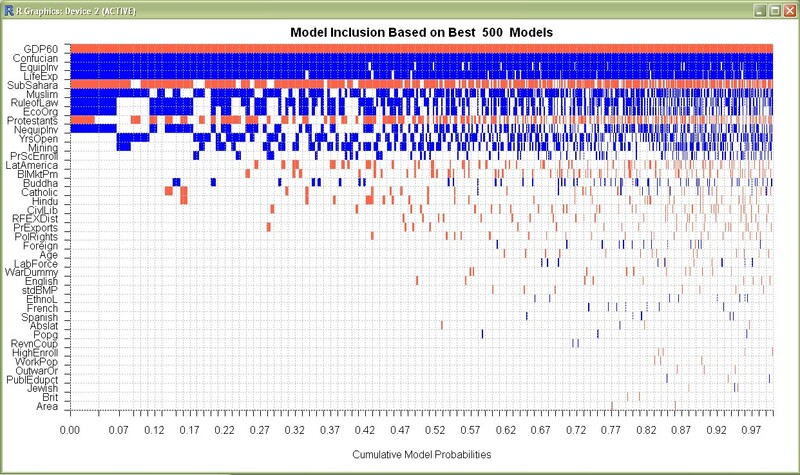 Of course, more ‘bad’ models are included in the aggregate information than just in the 2 000 best models. When looking at the results, the differences to FLS flip now: Now the small PIPs are greater than in FLS, and the large PIPs are smaller than the ones in FLS (since we include more ‘bad’ models). This code should do better. Beware of executing it immediately, as it could take some time (probably more than 10 minutes). Note that the vertical bars in FLS are used to indicate results from Sala-i-Martin (AER 1997), and do not correspond to vertical bars here. (to suppress the vertical lines, use the optional argument addons="" as below). Above, we used the command data(datafls) to obtain the growth data that was already ‘built-in’ into the BMS package. Of course the more ‘typical’ situation is to get data from an external file: and for Windows users, that’s frequently Excel. To leave a comment for the author, please follow the link and comment on their blog: BMS Add-ons » BMS Add-ons.